The PowerPac HV Power Supply supports an output of 5,000 V, 500 mA, and 400 W, which allows its use for all high-voltage applications, including low-current applications in the microampere range. It is ideal for IEF and DNA sequencing. With 400 W output, the PowerPac HV offers enough power to run the most demanding IEF experiments or up to four DNA sequencing cells simultaneously. Innovative, wireless run data transfer is possible with optional PowerPac Data Transfer Software, which makes it easy to organize, display, print, analyze, export, and annotate run data from the PowerPac HV Power Supply. 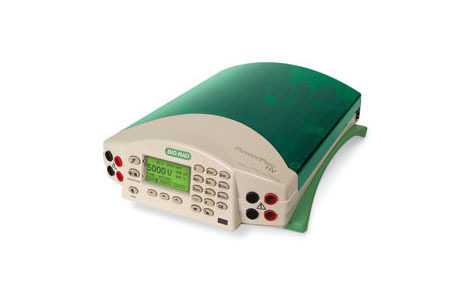 Easily transfer run data from anywhere in the laboratory using the power supply's built-in wireless IR capability. Data can be sent first to a PDA and then to a PC or directly to a PC with a peripheral IR receiving device. The optional temperature probe is used with the PowerPac HV Power Supply to monitor gel temperature between 30 and 90°C during electrophoresis. Temperature control is particularly useful for DNA sequencing and SSCP analysis, in which constant temperature is important for resolution and reproducibility.